For the Frankie outfit in GTA Vice City, see Frankie (outfit). For other characters of the same name, see Frankie Boyle, Frankie Gallo, Francis "Frankie" Garone or Francis "Frankie" McReary. 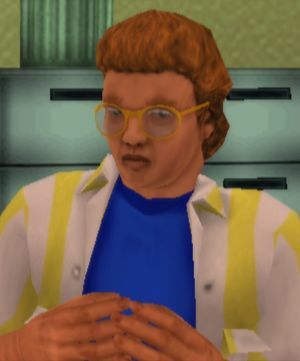 Frankie is a minor character in Grand Theft Auto: Vice City Stories, serving as Reni Wassulmaier's assistant for his/her advertising company based in InterGlobal Films studios. Frankie is depicted with an overly effeminate personality, which seemingly clicks well with Reni's behavior. However, Frankie is later fired for not "spanking" Reni and satisfying "his" pleasure. Even though Frankie is told that he is fired, he is seen again with Reni watching an on set rehearsal during the mission, "Say Cheese". This page was last modified on 8 November 2012, at 06:47.